Shop the best tires in Gahanna, OH at Firestone Complete Auto Care. We're the place to go for tire installation, mounting, balancing, repairs, and more! Searching for new tires in Gahanna? Then head to Firestone Complete Auto Care. Whether you drive a car, truck, minivan, or SUV, you'll find some of the best tire deals! 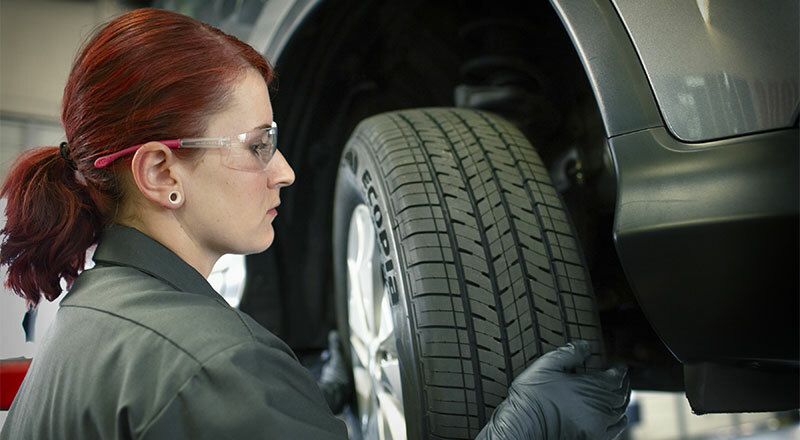 Our technicians will help you decide the best tires for your budget, lifestyle, and climate. Shop our huge tire catalog online and learn more about trusted brands like Bridgestone and Firestone. Then schedule your installation at a time that's convenient for you! From run flat tires to eco-friendly tires, Firestone Complete Auto Care is the tire place for you! How do you know when your tire wear has gone too far? Our experienced technicians can help, but you can do a quick inspection in your driveway too. First, examine your tread wear. If the treads appear worn or shallow, your tires may not have enough grip to keep your vehicle on the road. That's a safety problem! Also, pay attention to any tears, bumps, bulges, or sidewall cracks, and figure out how old your tires are. Your tread may look A-OK, but car manufacturers usually recommend getting new tires every six to ten years. It can be a safety concern, which is extremely important to us at Firestone Complete Auto Care in Gahanna. Set a course for a cross-country adventure or invest in better gas mileage with the right tires from your nearby tire place, Firestone Complete Auto Care. You'll find the size you need from brands you trust, including Firestone, Bridgestone, and Primewell. Put your car in our care and we'll deliver more than expert advice and tire installation. You'll also receive free tread and pressure checks, along with reliable flat tire repair, alignment, and rotation. We've been one of Gahanna's tire shops of choice for many years, and a leading tire provider in this country for almost a century. For handcrafted service you can trust, choose Firestone Complete Auto Care. Find your nearest location and schedule a tire installation appointment today! From drivetrain services to engine tune-ups to headlight replacements, head to a Firestone Complete Auto Care near you for your auto service needs. We're your local car care center, tire store, and automotive shop combined into one. Our professional technicians work hard to help ensure that your vehicle runs the way it should. When you bring your car or truck to us for maintenance, we promise quality service at an affordable price. Explore our services and at your convenience, schedule your next courtesy check or repair in Gahanna, Ohio today.